The effects of global warming around the Hudson Bay in Churchill, Manitoba could have a serious impact on this Polar Bear and many others in the region. Global warming around the Hudson Bay in Churchill, Manitoba could have a serious effect on the Polar Bears and could possibly lead them into extinction. This Polar Bear is waiting for the Hudson Bay to freeze over so that he can venture out onto the ice in search of ringed seals. Polar Bears usually start to come to life near the end of October around Churchill, Manitoba and wait patiently for the pack ice to arrive which starts around the onset of November. Around the end of November or part way through December, the ice becomes thick enough for a Polar Bear to venture onto in search of ringed seal meals. ... Their return to the shores along the Hudson Bay is happening about three weeks earlier than twenty years ago and if they have not eaten enough, the long summer months could have a huge impact on their survival rate. Scientists have been keeping a close eye on the climate change around the Hudson Bay and the seriousness that comes along with global warming. If the Polar Bears do not get enough to eat, the number of bears that will travel into the town of Churchill, Manitoba for more food will increase dramatically. The size of the Polar Bear will decrease significantly as well as their health and female bears will have cubs that are not healthy are stop having them all together. There has not been a significant decrease in numbers yet, but if the global warming continues, the Polar Bear community will be discontinued. No one knows the truth as to why global warming is happening but if we as humans are causing the problem, everyone should try to do their part. If every person throughout the world did a small part to prevent global warming from continuing, it could mean life, not death for a Polar Bear. 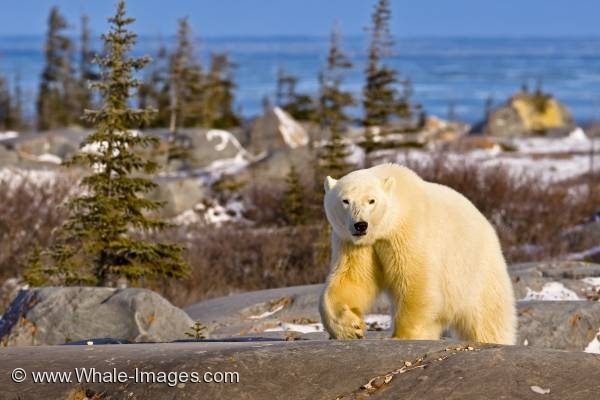 Polar Bear, Ursus maritimus, near Hudson Bay, Churchill, Manitoba, Canada. Here you can find more pictures about global warming.